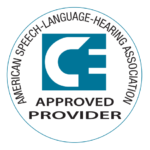 To obtain ASHA CEUs you must complete the ASHA CEU form. On the top of the form, please indicate your USSAAC member number, (e.g. write in “USSAAC member #12345). If you are not a USSAAC member, CEUs are $25.00 US for each webinar. Click here to pay the $25 fee via PayPal. On the top of your form, please indicate the PayPal receipt number, which will appear on the email confirmation your receive from PayPal, e.g. Receipt No: 2000-000-000-0000. Scan and email your completed CEU form to smeehan8@ku.edu NO LATER THAN TWO WEEKS from the date of the webinar for which credit is being sought. Please complete the evaluation survey for this webinar. Your feedback and suggestions for future events and topics is very important to us.